The European Road Championships 2015 in Tartu, Estonia are about to begin. Here's a quick look on all you need to know about the race. Trofeo Karlsberg is one of the hardest races in the Juniors racing calendar. It's a UCI race and has the status of a nations cup stage race, meaning the teams competing consist of national teams. Representing 19 countries in total including some strong cycling nations such as Belgium, Netherlands, Germany, France, USA and Italy, just a few to mention. The race consisted of 3 days of racing and 4 stages in total between 5th and 7th of June 2015. Together with part of the Finnish team we started our journey towards Gersheim, Germany on June 2nd. Last week I got a call and that changed my plans for the upcoming week. I was supposed to go to Pirkan Pyöräily and ride the 217 km long route, but instead I will head towards Germany tomorrow. More precisely, Trofeo Karlsberg together with the Finnish Junior National Road Cycling Team. We will leave Turku tomorrow evening and will arrive at our destination in Gersheim on Thursday. It's now more than a week ago since the TS Kortteliajot was ridden and I finally got time to put together a small race report. The TS Kortteliajot Sunday started off with slight rain in the morning, meaning the race would be ridden in wet conditions. That would make the hard race even harder. Fincycling had a 5 man strong team for the race. The Simo Klimscheffskij memorial race opened the Skoda Maantiecup last weekend in Turku, Finland. Fincycling had a 6 man strong team for the race consisting of; Joel Bergman, Simo Terävä, Jaakko Hänninen, Aku Keloneva, Ville Hirvenoja and Jonas Nordström. This weekend is the official grand opening of the Finnish road cycling season. Simo Klimscheffskij memorial ride will be ridden on Saturday and TS Kortteliajot will be ridden on Sunday. Fincycling will be racing on both days. It has been a great couple of weeks with a lot going on around Fincycling. As I am writing this, the team is heading for Otepää, Estonia for the second training camp this spring. 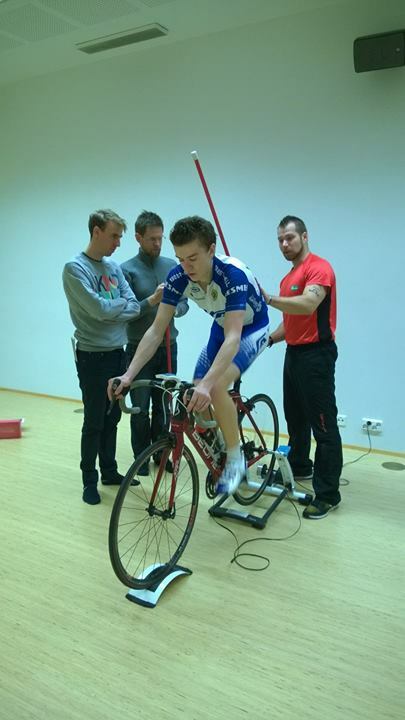 The first training camp was held in Tikkurila between March 21st and 22nd. Another important event, a press conference, was held on Monday March 30th. A new team and new sponsors were introduced and the event was well noticed by the Finnish press. In this article you can read about the first training camp, the Fincycling 2015 team, the schedule for 2015 and about the Fincycling press conference. The Fincycling project continues to grow as we saw an agreement between the Cycling Union of Finland (Suomen Pyöräilyunioni ry) and Fincycling take shape January 6th 2015. The great efforts done by the whole Fincycling team has paid off, and for the coming years 2015 - 2017, Fincycling will be taking care of the U19 boys training and racing schedule. This if something is a proof of a job well done and shows the level of trust for this project. First season for Fincycling is now behind. A first year is often a year of learning, both for the cyclists and the staff. And this was exactly what the first year was for Fincycling as well, learning by doing. And there was a lot of doing. The Cup of Zemgale stage race in Latvia began today in a great way. The 3,1 km long prologue was won by Niklas "Nikke" Henttala representing Fincycling with an average speed of 47,29 km/h in 3 minutes and 56 seconds. 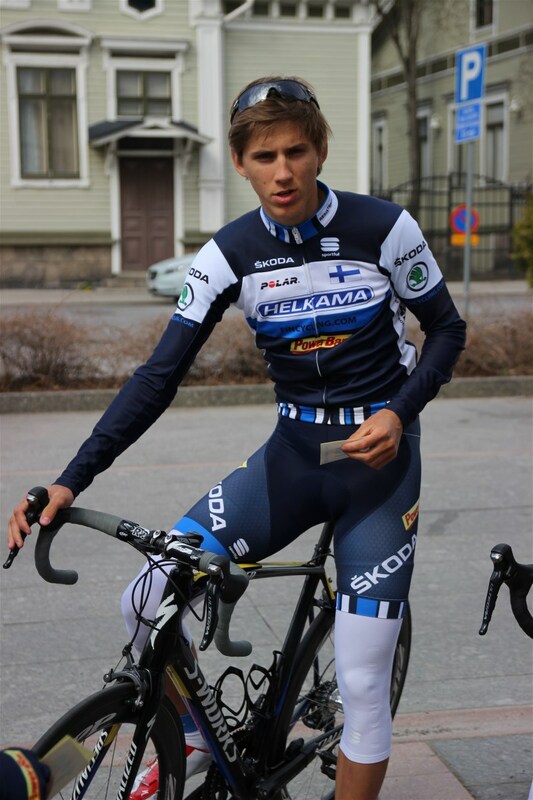 Niklas is one of the talented Junior riders in the team, and he will be wearing the leader's yellow jersey tomorrow. You can find the full result list here. The race will continue with a 70 km stage tomorrow following by another ITT stage. The race will end on Saturday August 30th. Five stages with somewhat short stages will make the race really explosive. Juniors from many strong cycling countries are represented, such as Estonia, Latvia, Lithuania, Poland, Russia, Belarus and Finland of course. What's great about this week's race is that the Fincycling squad is actually "bigger" than usual. Besides juniors who have been competing with Fincycling throughout the season, also juniors who will join the squad next year have the opportunity to race with the team. The only way to become a professional is to compete on a high level, and with Fincycling this opportunity is given to our young talented riders. At the beginning of the season talking with the Fincycling people, we heard that the first year will be dedicated to the junior boys aged 16-18 and that the project would aim to support even girls and U23 men in the future, maybe in some years. Well the Fincycling squad has already done something supportive for both of those. Earlier this month in Norway, the Fincycling team introduced girls in their squad in the Arctic Heroes of Tomorrow Race (more of this later). And again, in Cup of Zemgale the Fincycling team is introducing Laura Vainionpää (W U23) to the racing field. It's a great way to gain experience competing with the guys. It is with joy I watch the Fincycling team, that began as a project only less than a year ago, grow and do so much good to the sport in Finland. More than any Finnish national organization has been able to do in a long time, maybe ever? Having heard how the boys have learned during this year, and been able to improve as cyclists both in and out of the saddle makes me really feel positive about the future of Finnish cycling. Of course there are lots and lots of work to do and we know the road to the elite is tough, but all the hard work done by the Fincycling team gives a solid ground for our juniors to build on. Fincycling season is well on its way, and so far the team has been racing in Estonia, Finland and Poland. Next up is a stage race in Finland this weekend (AHH etappiajot) and Switzerland (46ème Tour du Pays de Vaud) next week. Aleksi Hänninen, Niklas Henttala, Lauri Koski, Erik Relanto, Jaakko Hänninen and Antto Tunkkari build up the Fincycling team in AHH etappiajot and the team representing Fincycling in 46ème Tour du Pays de Vaud is Aleksi Hänninen, Niklas Henttala, Lauri Koski, Erik Relanto, Antto Tunkkari and Marco Tapio Niemi. As a small wrap up from the early season start here is a small recap of day 2 in Turku a couple of weeks ago, part 1 you can still find here. After a great day one and a successful gala-evening Fincycling was ready for day two, TS Kortteliajot in Turku, a real spring classic in Finland. Every team and rider in Finland wants to win this race, and usually it ends up in a bunch sprint. Team Fincycling was having five riders for the race, Sasu Halme, Aleksi Hänninen, Antto Tunkkari, Waltteri Lepistö and Arttu Suvisaari. And off it went, Fincycling at the front, of course! The boys reacted to all breakaway attempts, strong performance once again! Who's keeping up the pace and making the race difficult for everyone? Fincycling of course! Sasu had a super strong day! He was attacking and attacking and closing gaps, working like Voigt one could say! Antto was misplaced in the bunch and lost control to the front and was flagged off towards the end.He really fought until the end! Charly giving feedback and support for a good job done. TWD Länken had a stronger team this time and Ilari Kahila took the win after a perfect leadout. A superb job all day by Sasu, he finished 7th with the same time as the winner. Fincycling after the finish. Good job all weekend! It was great to see the guys executing the tactics set up for both days and they really made the race hard for everyone. Experience is what is needed to win, the boys are on their way on the learning curve, and having seen the attitude the whole team has it is a promising start indeed. So let's wish our guys the best for AHH etappiajot and the 46ème Tour du Pays de Vaud next week. Kilpapyöräily ry., founded in October 2013, has started the season 2014 with a great pace. The association aims to lift the Finnish cycle racing scene to a level where it deserves to be – it’s after all one of the most popular competitive sports in our neighboring countries. The founding members of the association (27 members) have all achieved an internationally successful career, and some are still active in the world of elite cycling. Such members are Jussi Veikkanen, Kjell Carlström, Charly Wegelius, Joona Laukka, Mika Hämäläinen, Jukka Heinikainen and Kimmo Kananen – to name a few. Ambitious goals were set up for the first season: 16-18 year old junior cyclists from national teams around the country will be participating in both international and top national races, resulting in some 65-70 race days during the 2014 season. The operations are made possible by dedicated voluntary work by the founding members and by the financial support from the sponsors, SKODA, Helkama, PowerBar, Sportful, Shimano, EuroSport, Polar, dmp, Javatrans and Leijona-tuote. During the 2014 season, at least 14 boys will participate in international races, following the international rules of attending with a six man strong team in each race. 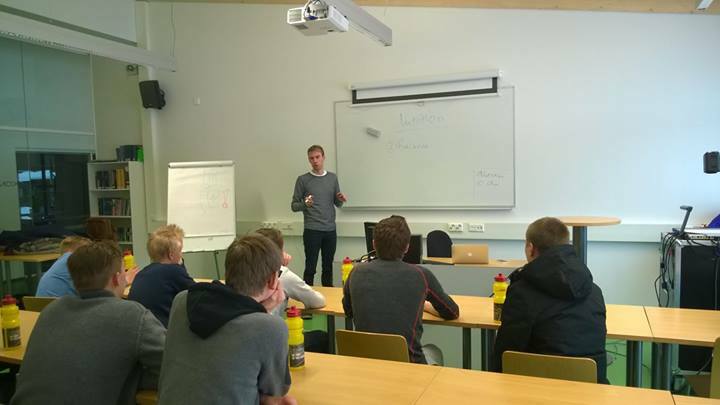 The first kickoff was held with 14 boys at Solvalla Idrottsinstitut between January 31st and February 2nd. The aim of the camp was to inform the boys, their coaches and parents about the project and what it would be all about. Charly Wegelius (Garmin-Sharp), Kjell Carlström (IAM Cycling), Kimmo Kananen (Shimano), Jani Paju (Fustra), Juho Suikkari and Marko Vauhkonen all acted as instructors during the weekend. Focus was also set on the comprehensive training programs and the professionals shared their knowledge with the coaches. As cycling is a sport where proper set-up and equipment matter, the boys were instructed about the importance of an accurate bike fit and the impact it can have in both comfort and efficiency on the bike. These instructions were provided by Shimano Nordic and Fustra. The technical and tactical aspects were also highlighted and presented both with interactive conversations and through watching some interesting videos. The importance of nutrition during both training and racing was equally highlighted. Fincycling team is energized with PowerBar products. Our boys made a trip to Estonia during Easter. The team consisted of Simo Terävä (16), Jonne Itkonen (16), Jaakko Hänninen (17), Ville Hirvenoja (17), Walteri Lepistö (18) and Lauri Koski (18). 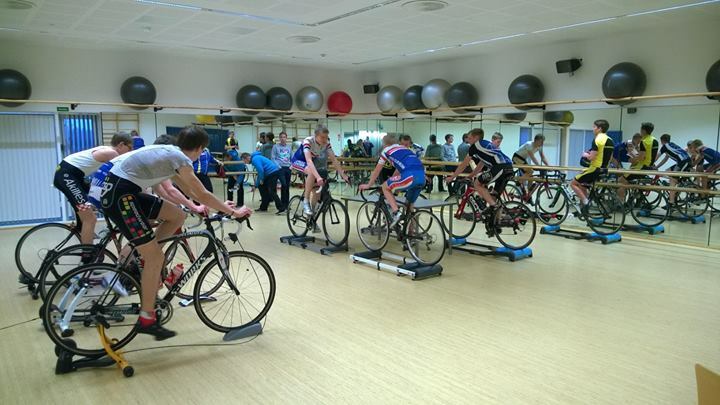 In Estonia we lived and trained together with the National Junior cycling team of Estonia who live and train in Audentese Sports-school in Otepää. A race was also scheduled for Sunday, a national race with 271 cyclists at the start line, among them ex-professionals and team Alfa Baltic, a professional team from Latvia. The Fincycling team started off well and the boys executed and followed the pre-planned race tactics all the way. 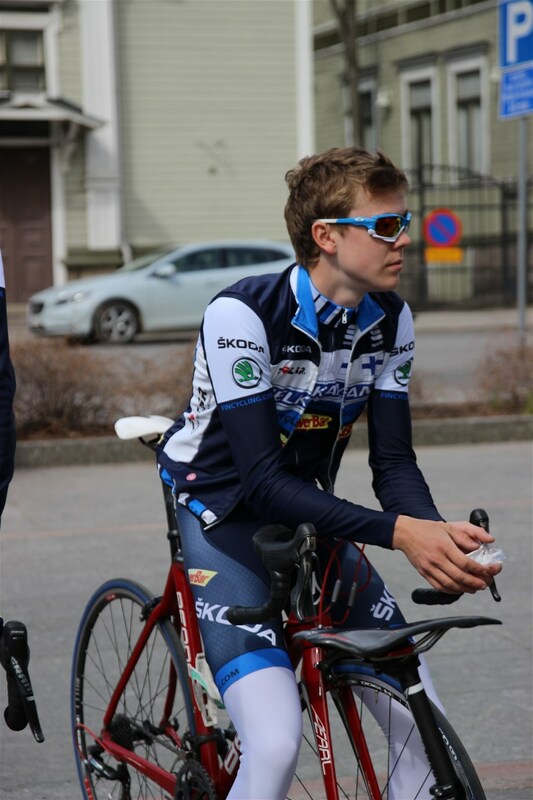 A good effort was rewarded with a great 14th place for Waltteri Lepistö (5th in the youth classification). Toomas Kirsipuu, a legendary Estonian ex professional cyclist was also impressed by the Fincycling team effort. Toomas, who today actively supports the local junior cyclists, also participated in the race and therefore closely followed the Fincycling team in action. April 26th and 27th marks the official cycling season opening in Turku, Finland. Fincycling took part with a team consisting of Aleksi Hänninen (18), Sasu Halme (18),Waltteri Lepistö(18), Antto Tunkkari (18) and Arttu Suvisaari (18). Charly Wegelius, former world-class professional cyclist and today one of the sports directors at Team Garmin-Sharp flew to Finland and joined the team on Saturday morning. Charly Wegelius was the sports director for team Fincycling during the weekend. Having such a person in the team as Charly gives the boys in Fincycling the best possible guidance and support on their way to the world elite. The race tactics was again executed close to perfection and our rider Aleksi Hänninen was in the 12-man breakaway, which went all the way to the finish. The race was won by a Latvian professional rider, Maris Bogdanovics, and Aleksi finished 10th overall being the best junior. 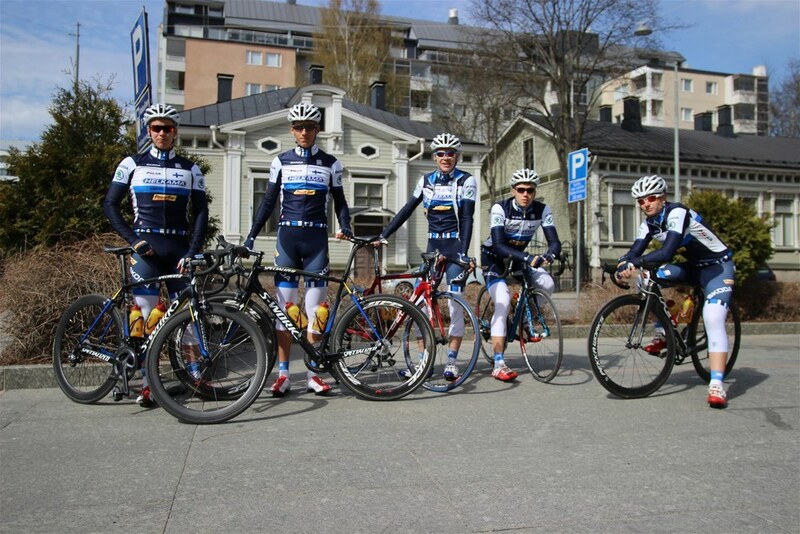 The Finnish spring classic, Turun Sanomien kortteliajot the following day was another good performance by the team. The race plan was executed once again well, and especially Sasu Halme had a strong day in the saddle being at the front throughout the race and fighting at the final bunch sprint. TWD-Länken, the number one road cycling team in Finland this time had more riders and a stronger team and made a good leadout for the winner Ilari Kahila. Sasu Halme crossed the finish line as 7th rider and secured the junior overall win with Aleksi Hänninen taking overall second place for team Fincycling (Pavel Sveshnikov 3rd). During the weekend Kilpapyöräily ry. also organized a cycling season 2014 - opening gala as a part of financing its own operations. The work done by the association has drawn a great attention in significant cycling countries, therefore many professional teams and cyclists donated valuable items for an auction held at the gala. Items were donated by reigning road cycling world champion Rui Costa (Team LAMPRE-MERIDA), Team SKY, Sylvain Chavanel (Team IAM Cycling), Daniel Martin (Team Garmin-Sharp) and the reigning Finnish road cycling champion Jussi Veikkanen (Team FDJ.fr) to mention a few. The project also awoke interest and enthusiasm, which culminated in the auction. –A great project to support our youth, educating both internationalization and cycling at the same time, Marko Toivonen, Sales Manager of DMP Diesel added. He became the owner of a valuable Team Sky signed jersey. The first international race, La Coupe du Président de la Ville de Grudziadz (UCI 2.1), was ridden in Poland between May 1st and May 5th. The race included 5 stages with a total length of 408,1 km. A UCI 2.1 race is the highest category for juniors where only national-, Team- and clubs can attend. 176 riders, 36 teams with 10 nationalities entered the race. A major part of the roads were in bad shape, which would make the race really hard. Aleksi Hänninen (18), Marco-Tapio Niemi (18), Lauri Koski (18), Waltteri Lepistö (18), Arttu Suvisaari (18), Erik Relanto (17) formed the Fincycling squad with Mauno Uusivirta as soigneur (former professional cyclist with both Olympic and world championship experience) and Marko Vauhkonen as sports director. Few Fincycling boys have international experience. The objectives were to work well as a team and use the knowledge learnt during winter and spring from both Kjell Carlström and Charly Wegelius. The race began with a 12, 5 km team time-trial, Marco-Tapio was the only boy to have previous experience of a team time-trial. With a great support from Mauno Uusivirta who has lots of experience of team time-trials the team ended up with 21st place having an average speed of 49, 8 km/h, a really good effort. The following stage was ridden that same day and the rest of the stages in the coming days. Fortunately the condition of the roads was a bit better towards the end. Unfortunate was that two boys did catch a cold in the really chilly weather. Sports director Marko Vauhkonen was really pleased by all the actions during the race. Attitude, willingness to learn and team spirit could not have been better. – I really got emotional when I watched our boys execute everything they’ve learnt during the project so far, a really great way to show their respect for all people involved in the Fincycling project. The race in Poland was a great boost in the team self confidence, to the grade where Fincycling actually dominated the race events during the last stage. The whole team worked really hard to push Aleksi Hänninen to a podium place and top 15 overall position that day. Despite hard work, this time the goal was not reached, but the confidence within the team really grew a lot. Experience and confidence are key success factors in developing as a team and a cyclist. 1. Placing among the top third in the team classification. 36 teams started (5-6 man teams) where only 24 managed to finish the race, Fincycling being the 12th best team. Now it’s time to rest, go to school and prepare for future races. The next race will be between May 24th and May 25th where team Fincycling will participate in AAH Etappiajo, a Finnish national stage race (Elite) in Hyvinkää. When the race in Hyvinkää is finished, the team will immediately head for the next race in Switzerland, where they will participate in 46ème Tour du Pays de Vaud UCI 2.1 between May 29th and June 1st. Part 2 of the cycling weekend in Turku will be released soon, stay tuned! You can find Part one here. Fincycling opened the national racing season last weekend in Turku.This is the first part of the race report from the weekend and includes the story from Simo Klimscheffskij’n muistoajo - race on Saturday (and loads of pictures and a video). The second part will cover the following day of racing - TS Kortteliajot on Sunday. Saturday began with the team arriving to Turku at around mid-day. The team for the weekend was built up by 5 guys, Sasu Halme, Aleksi Hänninen, Antto Tunkkari, Waltteri Lepistö and Arttu Suvisaari. Usually the team consists of 6 riders but this time Jaakko Hänninen was unfortunate to be ill just before the race and couldn't participate. Marko Vauhkonen would serve as the mechanic and Charly Wegelius, also known as the sports director of Team Garmin-Sharp would be the sports director for Fincycling during the weekend. So again, the boys would have a highly skilled and experienced team to back them up. After a proper briefing by Charly Wegelius, it was time to change to race outfit. I have to say this team kit is really good looking. Not to mention it is the same quality Team Tinkoff-Saxo is racing. The race would be in Hirvensalo, just outside of Turku, this served as a good warmup for the guys, some 6 km to spin the legs before the race would start. The race would be 73 kilometers long and be ridden on a circuit with a length of 4 kilometers. The finish would be on top of a 800 m long hill, hard after many laps riding it over and over again. The race was pretty hectic. On each lap there was at least one breakaway attempt, and the Fincycling guys did a great job in having at least one cyclist at the front at all time, catching up those breakaways. And on one lap the breakaway was succesful, and there was Aleksi Hänninen working to form a proper gap to the peloton. The final climb was hard as expected and blew the legs out of many riders. Aleksi managed to hang in the last hundred meters and finished 10th. The other guys did tried to attack from the peloton in the final lap but didn't manage to create a gap to the peloton, and finished with the main group. All in all, a strong ride by the whole team, the boys were riding like men. Aleksi took 1st place in the M-18 class, next year the whole race! The next part will cover the Finnish spring classic TS Kortteliajot. Last but not least a little sneak peek in the Fincycling team car where Charly Wegelius gives instructions to Aleksi riding in the breakaway. Note! If you do want to use any of the pictures, please contact me! Fincycling, the cycling project started by Kilpapyöräily ry. is really moving forward in a great pace. The first race in Estonia 18th - 21st of April is just behind the corner and this is the first time we will see the young boys competing in their Fincycling equipment. Not long after that we will see the boys competing in Turku, Finland where also I will be reporting from. This will be the 26th and 27th of April, with Simo Klimscheffskij muistoajot on Saturday and TS Kortteliajot on Sunday. 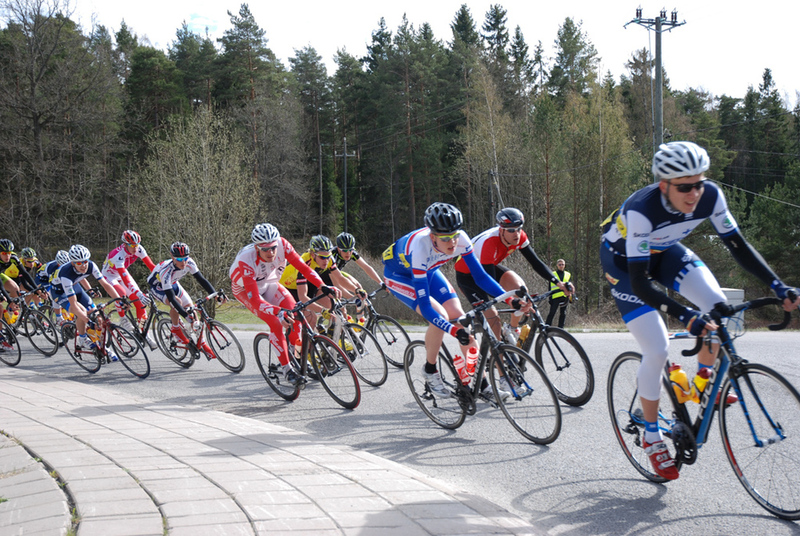 Besides these races, on Saturday 26th of April a cycling Gala will be held in Turku. Present will be some big names from the world of cycling as well as influential people in Finland. During the evening some of the names in the Fincycling team will be presented. To support the team, an auction will be held. There are some great items in this auction, for instance the current road cycling world champion jersey by Rui Alberto Faria da Costa, just one great item to mention. All the proceeds from the auction and the Gala will be used to support the Fincycling cyclists. If you have any questions regarding the Gala, you can for instance shoot Suomen Pyöräily nousuun facebook page with a message. The official invitation (in Finnish) you can find here. Another great thing for supporting the Fincycling team is the Kjell Carlström pyöräilyleiri (Kjell Carlström cycling camp). This is a training camp held in Solvalla idrottsinstitut 1.4 - 4.5.2014 and is a complete package with information about nutrition, how to train right, equipment, how to ride in group and much more. The coaching will be done by professionals such as Carlström himself. This is a unique chance for any active cyclists to improve both knowledge and results with the help of real cycling professionals. More information is found in Finnish and Swedish. It is great to see the Fincycling team gain more and more attention all the time, and it will be really exciting to have the race season opened soon. Besides the Fincycling team schedule, these young boys also compete for their local cycling teams in Finland. So a lot of racing coming up for the young cyclists. And as we all know, that's the only way to make progress and that's the way to do a name for yourself if you want to become a professional cyclist. These boys are on the right track. Let's keep the wheels turning! Read more about the Fincycling official launch here. The project launched by Kilpapyöräily ry, to lift the Finnish competitive cycling to a level where it deserves to be at, was finally publicly presented yesterday. Fincycling.com is the site where you will in the future be able to find all about the Fincycling Team and the progress. Of course I will be closely following this team and the project as well. To have such a professional and experienced squad including big names in cycling, both nationally and internationally known names (Carlström, Veikkanen, Wegelius, Laukka, Kananen and the list goes on and on) makes this project really stand out. Fincycling is a great example of what passion and will can create. The people involved have invested a lot of their spare time and money to this project, for many it is about giving back to cycling what cycling has given them. It is with great warmth and joy I watch this project progress day by day closer to the season start. It was also great to see that media had found interest in the project, our national public broadcasting channel YLE also presented Fincycling in the evening sports-news in both Finnish and Swedish. Link to Finnish here and in Swedish here. We also connected with Kjell Carlström, live on stage 6 of Tirreno-Adriatico with 120km to go. In a couple of months the Fincycling team has taken great leaps forward, and knowing the pace and the passion for the ones working on this project, we are surely going to see some great news in the upcoming months as well. So stay tuned, the season begins in April, I will keep you updated! As some of you might remember I wrote about the Finnish cycling project that aims at lifting our road cycling future to a whole new level. We have a strong history in endurance sports such as cross country skiing and running, but in cycling we've never been able to reach a level such as our Scandinavian neighbors Sweden, Norway and Denmark has. One could blame it on the weather conditions, but that doesn't make sense since our neighbors have the same conditions. I’m really happy and at the same time super excited about this new project that will hopefully have a huge impact in our cycling culture and finally help our young talents to reach the top elite in cycling. Suomen Kilpapyöräily ry (freely translated Finnish Cycle Racing association) was founded by 27 members not just anybody, but by the cycling elite in Finland including such names as current professional cyclist Jussi Veikkanen former professionals Charly Wegelius (directeur sportif, Team Garmin Sharp) and Kjell Carlström (directeur sportif, IAM Cycling Team) who are both still involved in the professional cycling today. Just last week I had the opportunity to meet one of the founding members of Suomen Kilpapyöräily ry., Marko Vauhkonen. Marko has a strong background in cycling, as one of his best personal achievements as a cyclist he mention the year 1984 and the Nordic championships (track) where he took a bronze medal. He has a strong background in international cycling as well, having experienced both European and world championships in both road- and track cycling. Marko Vauhkonen - Suomen Kilpapyöräily ry. I was really excited to meet him. Since I hadn't heard a lot about the project, but I knew there were many really big names behind it, I knew it would be big. We took a coffee and sat down, I thought it would be an hour, but I guess it took more than two and a half hours at the end. I guess when you have two cycling freaks talking about cycling, you shouldn't assume such things. Juho Suikkari, Kimmo Kananen, Kjell Carlström, Jari Vanninen, Peter Selin, Patrick Wackström, Sixten Wackström, Marko Vauhkonen, Mika Hämäläinen, Kimmo Karhu, Oscar Stenström, Tauno Hietala, Peter Klimscheffskij, Vesa Rauttu, Pertti Linna, Jouni Hakala, Joona Laukka, Jussi Veikkanen, Harri Hedgren, Veikko Sinisalo, Juha Poutiainen, Kari Myllymäki, Vesa Mattila, Jukka Heinikainen, Christian Selin, Charley Wegelius and Jyrki Tujunen. Many of you recognize some or most of of these names for sure. So after a "short" introduction of presenting myself to Marko and vice versa, I was eager to know how and why this project got started? It was easy for Marko to answer this question. It struck me how fast everything was built up. This of course is just a sign of how passionate these guys are about cycling and about their will to really do something important and big for cycling. At this point I was eager to know more and tried to take in all information possible. Q: What are the main goals for the project? “We want to look at this, not just as a single thing that will take our youth quickly to the top, but as a complete learning experience for our young riders. We have a clear mission to build sustainable, competitive and healthy youth. Money should not be an obstacle for anyone and our mission is to help, support and advice young riders how to be independent and help them gain international experience, which is such a crucial component in being successful. Cycling races were won by individual efforts back in the 1930’s, but today you win and lose as a team. All of us involved, we have a strong knowledge in the world of cycling all the way from the early -80’s, and we want to share that experience with our youngsters. We really want to emphasize the fact that cycling is a team sport more than anything else. We want our riders to really feel and internalize that what you give to the team, you’ll have back doubled. A team is as strong as its weakest link. Cycling races were won by individual efforts back in the 1930’s, but today you win and lose as a team. All of that makes sense, right? Think about being a young rider and having a team like that behind you, supporting, sharing thoughts and advice with you. Being together with your role models and having them support you must be a “dream come true” for any athlete. Q: What can you tell us about the support and visibility of the campaign so far? So at this point, having the backgrounds I really wanted to know more about the cyclists, the team the first training camp, well everything. I tried to hold myself together. Q: About the team, can you tell us more about the age group, what type of riders you have selected and how is the selection done? Q: In social media we saw a couple of weeks ago pictures and some stories from your first training camp. How was it, what was the agenda and how would you sum up the training camp? “Honestly, I’d say it was as good as a training camp can be. No, actually it was even better. It was one of the best training camps I've seen and experienced content-wise in my life. Probably it was so rich in content that the youngsters weren't able to assimilate everything, but if they were able to memorize 30 % of what was said, they already took a great leap forward as cyclists. Besides great lectures and support by Kimmo Kananen, Kjell Carlström and Charly Wegelius, we had an individual bike fit for the guys, surprisingly all had to make some adjustments in their positioning on the bike. We also had the opportunity to have Jani Paju with us, who introduced Fustra to the guys. Fustra has been a success in many countries and is also used by the top elite as a way to improve especially your core strength. In cycling, Fustra is used for instance by IAM Cycling Team. We also focused on activities that were not related to cycling where the focus was on building team spirit. And I think we nailed that as well, better than expected. As a final question I wanted to know when we’ll see a Finn on the podium, either in a spring Classics race or on a grand tour. Marko didn't need to think for long. And so, two and a half hours later we realized it was already pretty late. Time goes by so fast when you talk about cycling. I’m really excited to follow this project, and having heard many details I cannot yet reveal here, I’m looking forward to a year in cycling I've never experienced before. It was also really great to meet Marko, such a great person! I will be reporting about the project as it progresses so stay tuned! We will see the new team compete for the first in Finland in Turku, April 26th and 27th. So stay tuned for updates, there will be some great news, I promise you that!